A Bovver'64 in GTA Vice City Stories. A pre-release screenshot of a Bovver'64. 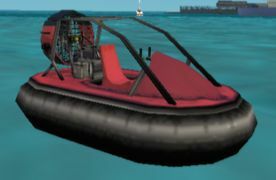 The Bovver'64 is a hovercraft water vehicle in Grand Theft Auto: Vice City Stories. It is similar to its Grand Theft Auto: San Andreas counterpart, the Vortex. Like the Vortex, the Bovver'64 lacks stable control as it has no grip and is considerably below average in speed; however, it can be driven on both the streets and the water. If it flips over when on the water, it is impossible to get it back up again. The Bovver'64 is also easily damaged and destroyed; strangely enough, the Bovver'64 is identified by the game as an aircraft and thus, it has the same violent explosion as the game's aircraft. The Bovver'64 cannot be repaired at a Pay 'n' Spray. The Bovver'64 can be bought behind The Clymenus Suite safehouse upon completing the mission "White Lies" where this vehicle is used to collect packages falling from a helicopter. It is also used in the side missions Haiti Hover Race and Harbor Hover Race. Whenever the horn is activated, the camera focuses straight on the Bovver'64. Nearby the junkyard in Little Haiti, activates the Haiti Hover Race. By a jetty in the middle of the water in Viceport, activates Harbor Hover Race. Can be bought on the jetty next to the Clymenus Suite safehouse in Vice Point for $4,500. Vortex, GTA San Andreas equivalent. This page was last modified on 7 July 2014, at 01:18.